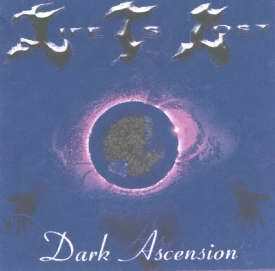 Life Is Lost's first release was back in 1998. 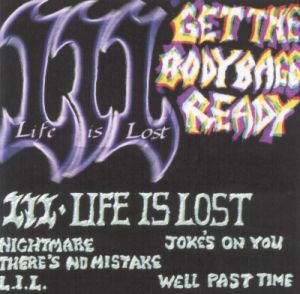 Get The BodyBags Ready tape featured 5 songs, Nightmare, Joke's On You, There's No Mistake, L.I.L, & Well Past Time. 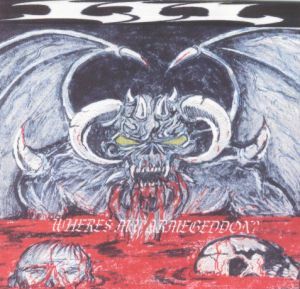 The first L.I.L full length came in late 2000 with "Where's My Armegeddon?" Recorded by Pat in early October of 2000 the 11 song cd consits of Get The BodyBags Ready, L.I.L, Dead At 23, Do You Still Hear Him Scream, Spineless, Answer It, There's No Mistake, Breaking The Circle, Fragmented, Well Past Time, & Reprise. The Martyrs Demo, recorded at Daydream Studios by Chris Day in January of 2001. The 4 song demo cd has the tracks Martyrs Of Satan, Human Cancer, Damnation Of Humanity, & Trandscendence. This cd was recorded by Jesse Smith of Zao. The tracks include: The Next Victim, Dark Ascension, The Final Hour, Deathbringer, No More Hope, Apocalyptic Sunrise, Martyrs Of Satan, The Ecstasy Of Hatred, (Bonus Tracks) Transcendence, Damnation Of Humanity.